I've been growing indoor citrus trees for 10 years now and have been very happy with the results. 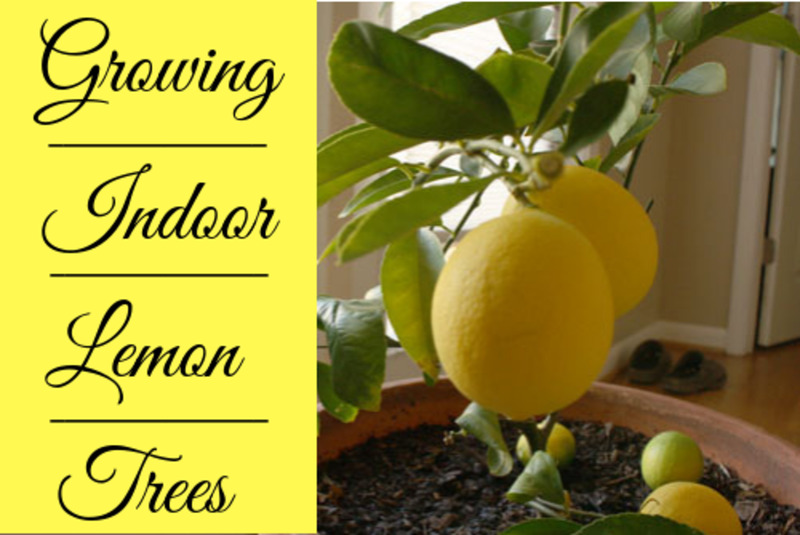 Growing fruit trees indoors is easy and very rewarding. You don't need to be living in a warm climate (or even have a green thumb) to grow your own lemons, limes, oranges, or many other fruit varieties in your own home. Dwarf fruit trees can be grown in containers indoors during the winter months and then brought outside when the weather warms up. We live in the Midwest and these little trees are a treat for the senses. Not only are they visually attractive—with their lush, green foliage and white blossoms—but they're quite fragrant as well. Kind of like a natural room air freshener! 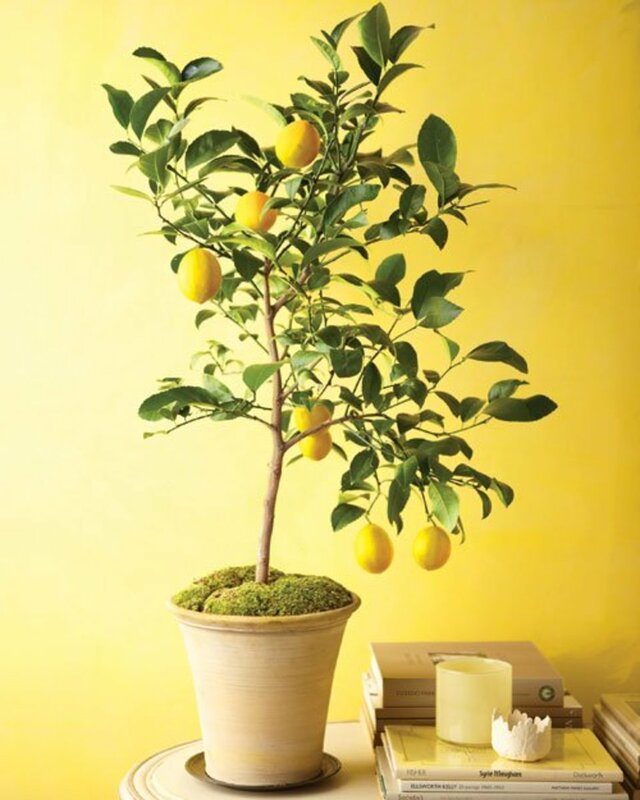 So why not add an indoor citrus tree to your home? They are easy to grow, it's fun to watch the fruit develop, and it's so satisfying to eat the ripe crop! They really do add a touch of the tropics to any living space. Place the plant in a south or southwest window for best exposure. Where natural lighting isn't available, use artificial lighting. People frequently want to grow some type of fruit tree in a container, usually because of poor soil, improper climate, or lack of sufficient space, as is often the case around apartments and condominiums. Fortunately, a wide variety of fruit trees can be grown in containers with success. One of the principal reasons for growing fruit trees in containers is portability. Thus, tropical and subtropical fruits can be grown in containers in areas where freezes might occur. The size and mobility of the containers allow the plants to be moved indoors during periods of predicated freezing temperatures. Many fruits can be successfully grown in containers: Meyer lemons (my favorite), key limes, dwarf oranges, kumquats, avocados, dwarf bananas, papayas, guavas, blackberries, dwarf grapefruits, blueberries, and figs are among the best suited for growing indoors and outdoors in a small space. Most will produce some fruit if given proper care. The list is by no means complete, however, as most fruit trees could be grown in containers if the size of the container was not a problem. Containers may be plastic, metal, clay, ceramic, wood, or any of the other kinds normally available at nurseries and garden supply stores. Used whiskey barrels cut in half are excellent, or wooden boxes may be built to order. The container should have adequate holes at the bottom for drainage of excess water. The drainage holes of the container may be covered with pieces of screen mesh to prevent the soil from washing out. A layer of gravel 1 to 2 inches deep should be placed in the bottom of the container to facilitate drainage. Any commercial potting soil should be suitable for growing fruit trees. However, a mixture of 1 part sand, 1 part peat, and 1 part bark, perlite, or vermiculite will also serve quite well. The potting medium should be loose enough to permit adequate but not excessive drainage. The container should be partially filled with soil (large containers should be filled at the site they are expected to remain). Place the plant in the partially filled container of soil to its correct planting depth, which is the depth at which the plant was previously grown. The final soil surface should be 1 to 4 inches below the rim of the container, in direct proportion to container size, to allow for watering. Complete filling the container and firm the soil around the plant. Water thoroughly but do not fertilize until new growth commences. An attractive mulch of bark, gravel or other material can be added to improve the appearance of the container. Most fruit crops grow best in full sunlight, but some will do well in partial shade. If other conditions are optimum, however, plants grow in direct proportion to the amount of light received. So container-grown fruit trees should be placed where they will receive maximum sunlight. It is important that rapid changes in light exposure be avoided, i.e. plants growing in partial shade should not be suddenly exposed to complete, direct sunlight. Any plants that are to be grown indoors part of the year should be acclimated by gradually reducing the light to which they are exposed for two to three weeks before moving them inside and vice versa for plants being moved outdoors. Such acclimation is not necessary for plants that are to be moved indoors for a few days during freezes. 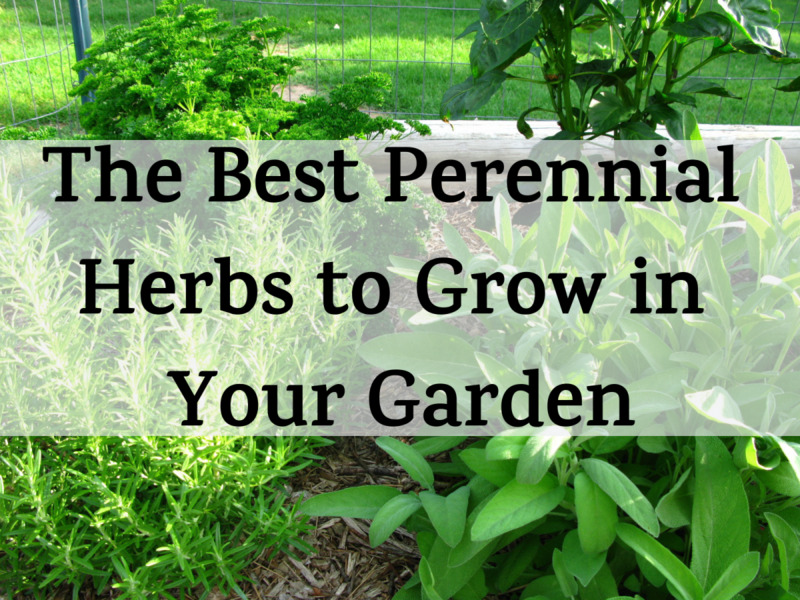 Cold hardiness depends on the plant, the care it receives, and many other factors. Tropical and subtropical fruit trees cannot tolerate freezing temperatures for very long. Some will be killed back to the soil by mild freezes, while only small twigs will be killed on others. Some root damage can occur because the root system is not as well insulated from cold in a container as it would be in the ground. Plants may be covered temporarily with blankets, paper, or other material as protection against hard freezes. But such material should be removed each morning to allow the plants to take full advantage of incoming solar radiation. Plants moved indoors during cold spells should be placed away from drafts caused by doors and heating ducts. When container-grown plants do not thrive, it is commonly due to faulty watering practices, usually overwatering. Plants growing in containers should be watered only as needed. The frequency of watering depends upon such variables as type and size of plant, type and size of container, temperature, humidity, potting medium, and other factors. For most plants, the upper surface of the soil should be allowed to become dry to the touch before watering. Then water thoroughly by slowly filling the container. Good drainage of excess water from the container is essential. A wilted tree means too little water. A tree with yellow leaves or folded leaves can indicate too much water (or a plant in need of more fertilizer). The soil in plastic, metal, and ceramic containers generally stays wet longer than it does in wood or clay containers, which allow water to evaporate through the sides. Cool weather generally slows plant growth, and this reduces the plant's need for moisture. So watering should be less frequent during cool weather. 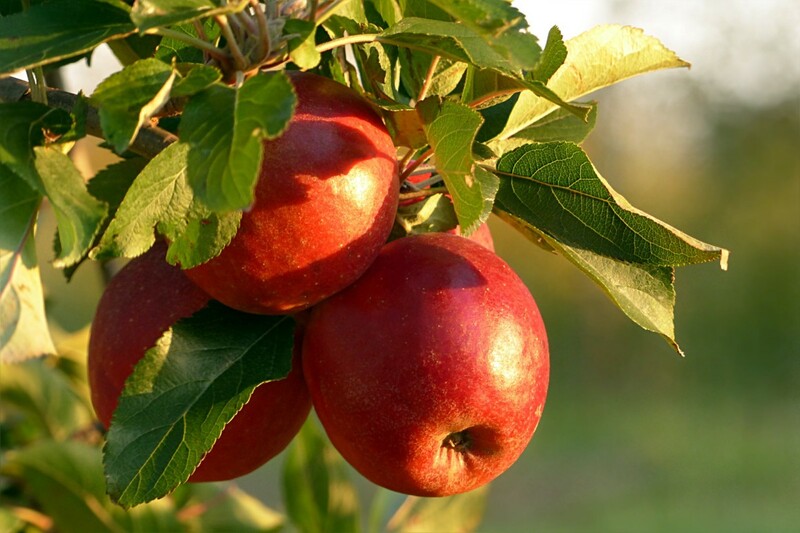 Good nutrition is essential to the success of container-grown fruit trees, but excess fertilizer can result in overgrowth, poor fruit, and possible dieback due to salt accumulation. 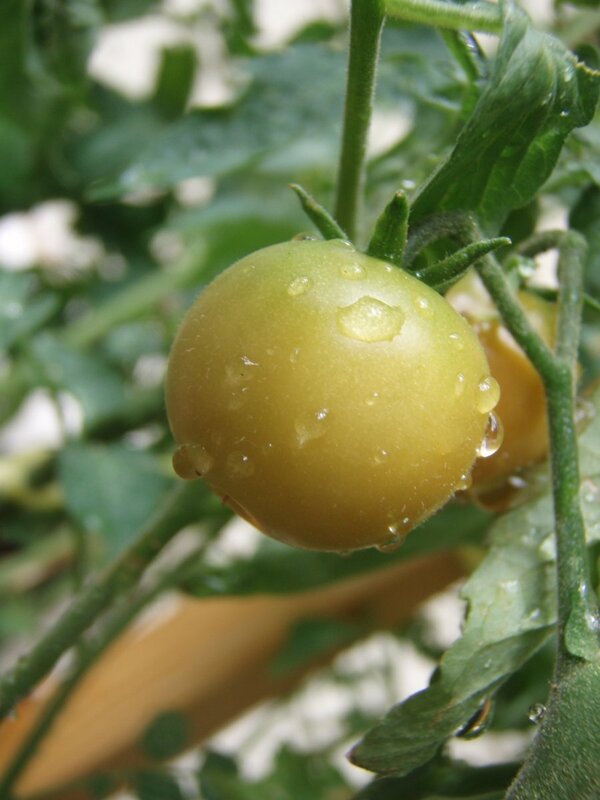 Water-soluble fertilizers are widely available and should be used according to label directions. If mature foliage is deep green in color, adequate fertilizer is being used. Many fertilizers can be used successfully, provided they are complete and balanced. The fertilizer should contain nitrogen, phosphorus, and potassium in balanced proportions and should include lesser amounts or traces of magnesium, iron, manganese, zinc, and copper. The ingredients and quantities of each nutrient contained are listed on the fertilizer label. Most fruit crops will produce fruit in containers, given time, good care, and adequate size and age. Naturally large fruit trees will require larger containers to bear much fruit, however, as the amount of fruit produced is proportional to the plant's size—so large yields should not be expected. Many fruit plants need to be large in order to fruit at all, so their size can quickly become limiting in containers. Some fruit crops also require the presence of pollenizer cultivars and pollinating insects. Flowers can be pollinated by hand if needed. Citrus requires a humidity level of 50 to 60 percent. Misting daily is very important. Try to make it part of your care routine. Meyer lemon trees are one of the most beautiful and fragrant citrus trees available. 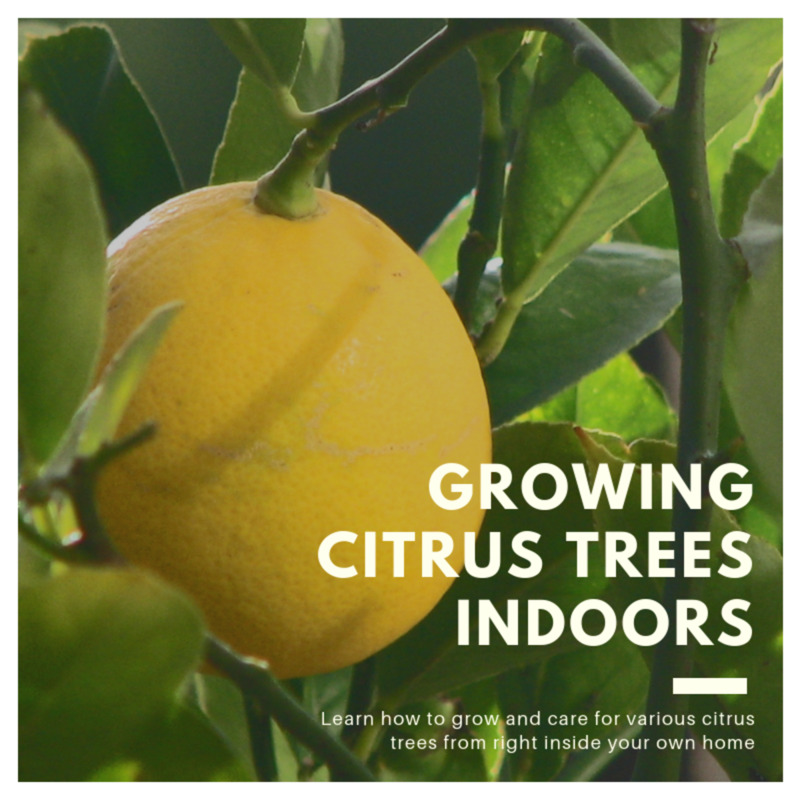 Which Citrus Tree Should You Grow Indoors? There are so many great fruit trees that can be grown indoors that it can sometimes be difficult to know which one you should try. Here's a quick breakdown of some of the best ones. Compact enough even for urban balconies and limited-space gardens, Meyer lemon trees will begin bearing large, juicy, thick-skinned fruit at an early age and just keep on producing them. You can grow them on the patio and enjoy the sight and scent of indoor winter blooms with this container-sized lemon tree. Even if there were no fruit at all, this evergreen would be attractive enough to grow as an ornamental. The leaves are lush and glossy, the small white flowers—arising indoors in late winter, just when the house needs some color and scent—are intensely fragrant, and the habit is upright and well-branched. Depending on the size of the container and pruning you give it, this tree could reach 8 feet high and 10 feet wide, but can also be kept much smaller with pruning. The lemons are the real prize of Meyer, however! They arise in clusters of about six after the blooms pass. Once this happens, you should immediately thin them to about two or three per cluster, unless you want more plentiful, but much smaller, fruits. The fruit is very juicy, with an extra-thick skin that's great for lemon zest. Not just ornamental, these are delicious lemons you will find yourself slicing and squeezing all year long. Give this tree plenty of sunshine and water indoors and out. When you bring it inside for the winter, place it by your sunniest window and rotate it frequently to get sunlight to all the leaves. If you have a window with afternoon sun exposure, that's best, but ample morning sun is just fine as well. If you're unfamiliar with kumquats, once you taste them you'll likely fall in love with their fresh, sweet taste! They are unusual in that their rind, or skin, is edible. In fact, the skin is the sweetest part of the fruit and is often used to make candies. The dwarf kumquat tree is very prolific and will yield fruit almost all year around. Like most indoor fruit trees, it will appreciate some times outdoors on a sunny patio during the warm summer months, although it's not required. The fragrance of this tree is particularly attractive, as is its foliage. The indoor kumquat tree will serve as a natural room freshener, much better than any from a spray bottle! Dwarf orange trees are smaller varieties of traditional citrus trees that are specifically designed to grow in containers indoors but still produce an amazing amount of fruit for their size. With proper care though, your tree should bear fruit within a year. To thrive, it will need about six hours of sun per day. Next, water the tree when the soil is almost completely dry. You will find that in most cases you will need to water once per week. In the interim, mist it with tepid water from a spray bottle. At full maturity, a dwarf orange tree will reach about 4 feet in height. The oranges themselves will be similar to what you find in a grocery store in terms of size. Generally, they will be sweeter and juicier due to the smaller size of the tree, because the full energy of the growth system is devoted to producing fruit. Even when the tree is not bearing fruit, it will make a wonderful addition to any room in your home. They have a pleasant, almost tropical scent. The leaves are a glossy green, and white flowers will bloom as well. Our dwarf orange tree serves as a natural air freshener, and yours will too! 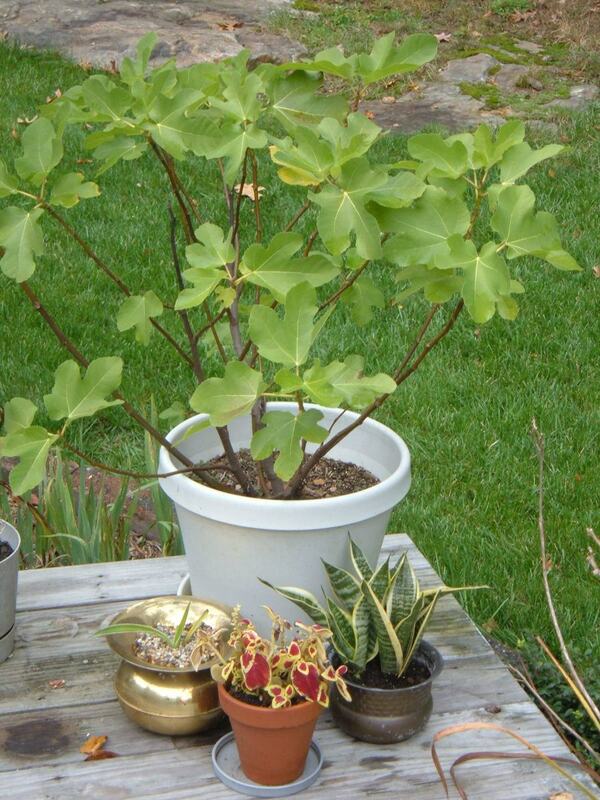 For the most part, dwarf lime trees are very hardy and easy care. They adapt well to almost any environment and are ideal for beginner and expert gardeners alike. Not only is there a real sense of satisfaction from growing your own fruit, but these trees add a touch of the tropics to any living space. We have successfully grown numerous varieties of indoor citrus trees for years. Their fresh, clean scent acts as a natural air freshener for any room in your home. Before watering, wait until the soil is almost completely dry. Depending on the humidity level in your home, this usually means weekly watering. These trees go through a rest period in the colder months, so water less frequently during winter. Clementines are becoming more and more popular due to their great taste and health benefits. Slightly smaller than an orange, they have the added benefit of being practically seedless. Kids also love them because they are super easy to peel! The skin practically falls off, yielding the sweet, juicy fruit. The indoor clementine tree will top off at about 3 feet and is remarkably pest and disease free. When container-grown plants do not thrive, it is commonly due to faulty watering practices, usually overwatering. Several important insect pests affect fruit grown in the home garden. Good quality, satisfactory fruit cannot be grown without good pest control and tree care. If you wish to grow your own fruit, you must be willing to learn the important pests and the methods to control them—then be willing to expend the time and effort to do the job right. Sanitation includes pruning and cleaning up twigs and branches and fruit that drops to the ground. Proper watering and fertilization helps maintain tree health and reduce stress. Good weed control beneath fruit trees—when trees may be outdoors during the summer—reduces the likelihood of cutworms, whiteflies, aphids, and other pests. Some of the most common pests are: moths, aphids, ants, leafhoppers, red spider mites, twig borers, and fruit flies. Misting your trees with water daily can help prevent an infestation, plus your trees will thank you for the added humidity! If you see any insects, especially under leaves or stems, spray your tree with an organic soap spray. Always wash fruit off thoroughly before eating. Not all insects are bad, however. Spiders, lady beetles, lacewings, and praying mantis are some of the beneficial insects you may see around your citrus tree when it's outdoors in the summer. 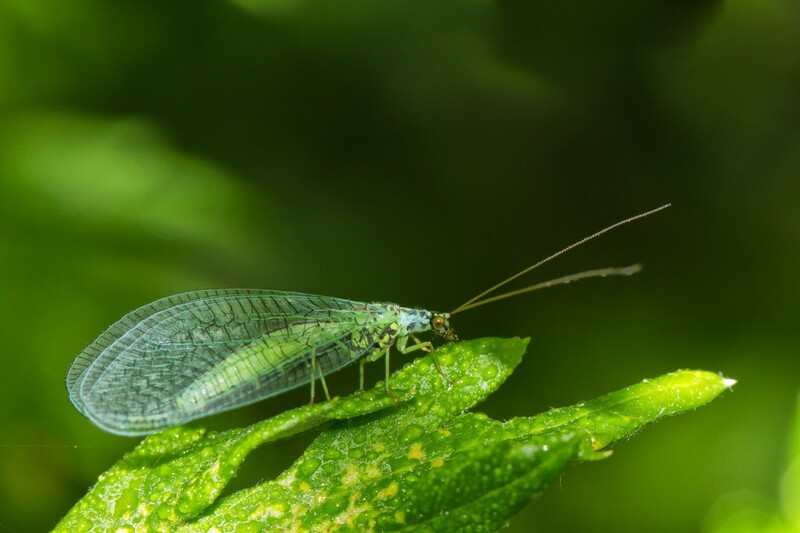 These bugs tend to eat the "bad guys," so they are good for your garden. Though interest in organic gardening and a growing demand for pesticide-free foods has exploded in recent years, even carefully washed vegetables can still contain the chemicals that were sprayed on them. We all want food that is safe to eat though. So instead of resorting to pest control sprays, give the "good guy" beneficial bugs a chance! When Should You Add Water? When the soil is dry an inch below the surface, add water. As with most trees and shrubs, pruning is important for nice shape, good health, and overall productivity of dwarf citrus trees. Regular maintenance pruning to remove dead or diseased wood—or wood that is growing awkwardly—is also very important. But unlike pruning ornamental trees and shrubs, properly pruning dwarf citrus trees makes a difference between large, annual crops of excellent fruit, or intermittent crops of variable quality. Because dwarf citrus trees are encouraged to bear lots of large fruits, pruning the trees will help develop a strong branch system capable of withstanding the annual load of ripe fruit. A dwarf citrus tree allowed to bear all the fruit it sets in the spring will produce lots of poor quality fruit, or it will produce well only every other year. For consistently good crops you MUST thin clusters of young fruit to a single fruit. Do this when the fruit is still small (between marble and golf ball size—depending on variety). Each fruit should be 6 inches or more from its neighbor. Such thorough fruit thinning is time consuming, but you will appreciate the effort and be rewarded with a better quality crop. Frequently, the top will grow rather large and begin to exceed the capability of the root system. Consequently, some leaf shed and twig dieback will often occur. Such plants should be pruned back heavily to rejuvenate them. Prune middle branches on dwarf citrus trees to allow ample sunlight to reach into the middle of the tree, otherwise fruits will not ripen properly and will lack good color. Pruning also allows for good air circulation through the crown, which helps prevent disease and discourages pests from making a home in your tree. Note: When plants are heavily pruned, less fertilizer and water will be necessary to account for the reduced plant size. Trimming, shaping, and pruning helps you to maintain your tree in a manageable manner for your growing space. Put fresh potting soil in the bottom of a new, larger container. Fill the container only about one-eighth full at this time. Tip the plant on its side. 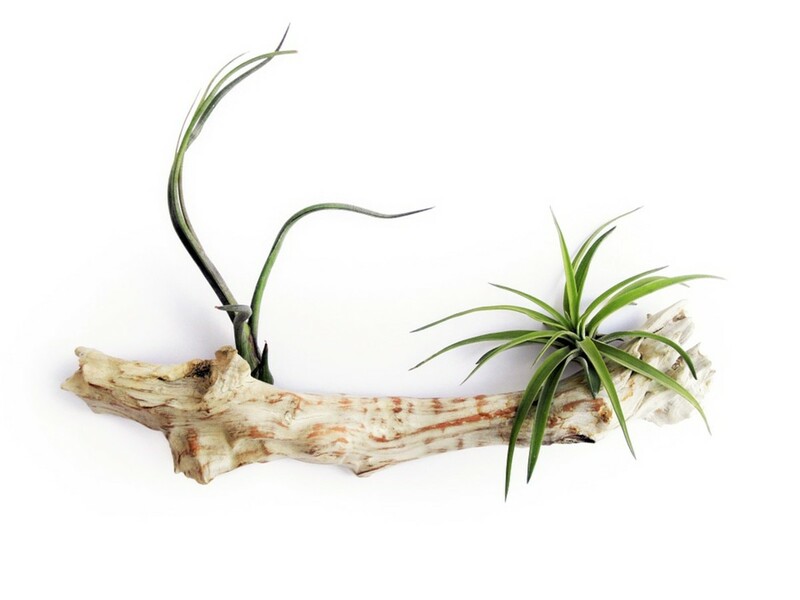 Lightly tap the root system out of its current pot. Set the root system in place in the new container. Center the rootball and trunk in the pot. The top of the rootball should be about half an inch below the rim of the new pot. If needed, remove your tree and add more soil mix until it sits at the proper height. Now add more fresh potting mix to fill around the sides and rootball. Pack down the mix so your plant is secure and not wobbly. It's best to increase pot size incrementally at each repotting. Choose a container that is 2 to 4 inches bigger than the one the indoor citrus tree is currently growing in. Citrus trees are heavy feeders. You should nourish your tree four to six times a year with a chelated mix of manganese, iron, and zinc (found in most multipurpose fertilizers). If you've discovered the joy of growing an indoor fruit tree, you're likely very pleased with their low maintenance. Just about anyone can grow these citrus trees in just about any living space. Their fragrant blossoms and sweet delicious fruit make them a welcome addition to any home. Select the right size pot with adequate drainage holes—we recommend a 16+ inch pot. Plant the tree so the root collar is above the soil line and the top of the root crown is barely below the soil. Do not cover the trunk with soil at all. If you need to add soil to your tree container, never use soil from the yard or anywhere outside. Get a soil mixture with perlite mixed in, as you want it to drain well. You can buy this mix online or at most garden centers. The soil mixture should be an airy potting soil, and you should add soil up to the line on the trunk where discoloration from the dirt used by the nursery ends. Leave enough space at the top of the pot to water thoroughly. These trees like regular watering. For the most part, every 7 to 10 days is plenty. When the soil is no longer damp, go ahead and water. Be thorough but don't drench the soil. As for light exposure, a western or southern exposure is best. Not only do indoor citrus trees like water, they like to be fed as well. Once a month, fertilize them with a specially formulated fertilizer made for indoor citrus varieties. If you don't want to buy a specialized fertilizer, no worries. The key ingredients are zinc, iron, and manganese. Most good quality multipurpose fertilizers contain these ingredients. Most humans hate humidity, but as you might imagine, indoor citrus trees love it. If your living space is dry, particularly in the colder months, add moisture with a humidifier, or mist them frequently. Another good idea is to place your tree container in a tray filled with pebbles, with water added to the top of the pebbles. Note of caution: Don't put your tree directly in front of a drafty vent. When it gets warm outside, give your tree some TLC, and let it live outside on a patio or balcony. The outdoor sun will do your tree good, as long as you acclimate it to full sunlight gradually. We usually place our trees in a shady area for a few days first. If possible, try to work your trees up to six to eight hours of direct sunlight a day. After you've owned your tree for a while, you'll notice it will produce quite a number of blossoms. Not all of these blossoms will produce fruit, but you can help encourage fruit production. Take a soft small paintbrush and brush the stamens of open blossoms. Basically, you're helping the pollination process. For pests, spray your tree with an organic soap spray or horticultural oil. 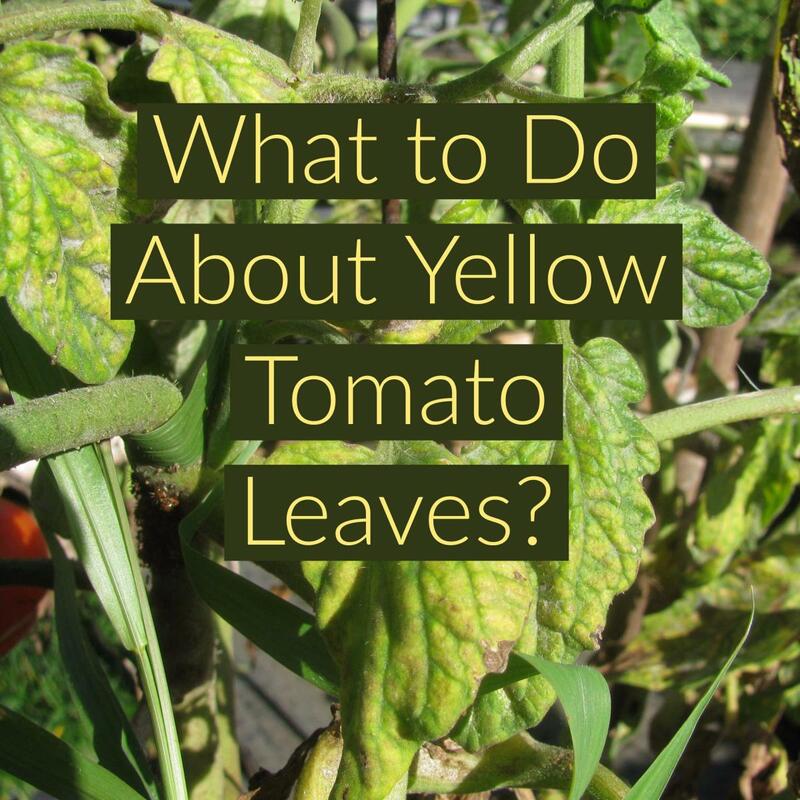 Your most common pest will likely be spider mites, whiteflies, or aphids. Misting the tree daily with water helps to discourage pest infestations and helps keep the tree dust free. I live in karachi Pakistan.I have a lemon plant in cotainer of 20inches wide.Lot many fruits are coming but the juice is very less.Fruit is round with thin skin.I wants its name because local nursury plant salers dont know its name.Please suggest the name and give me some tips for increasing fruit juice. I've started several lemon trees last year from seeds it was very easy to do. I just love lemons! I had absolutely no idea that you could grow citrus trees indoors. Although I have no business trying that since I have 10 acres to plant on, but it is nice to think about. Good work here, I love it and been enlightened. Hope some of these are not environment dependent. Makes me want to clear out everything else to make room for a few or more of these varieties, lol. Would love to have lovely pure, citrus aromas throughout the house. Great hub. Thanks! Citrus trees are FULL SUN. If you try to grow them indoors the leaves will fall off and the tree will die. That is why they grow in warm regions. It's a fact. Ask an expert gardener. Wow, thank you for all of the info! I had an indoor Meyer lemon tree but it died from a mealyworm infestation (didn't know that is what it was at the time as it looked like a fungus). Anyway, I'm going to give it a try again along with that olive tree once I get some pots. Hopefully this time, following your helpful advice, I can keep them both alive for many years to come and then create some of your yummy looking recipes. Thank you! This is very informative. We do have a lemon and lime tree. I have 5 lemon trees growing from seed. They are small, 6 inches high. Have a mango started. Wish to find an olive pit... I think growing fruit trees is fun and rewarding. I just recently got 2 indoor lime trees. I'm excited to see how they do...and I stumbled on your lens at the right time. Thanks for the great information!!!! Wow what a great lens, I did not know that you could grow these indoors. I absolutely love this lens and all your tips. I've been having problems with my indoor lemon tree so I stopped by. Now I think I will try repotting it and giving it more humidity. Also, love the recipes you've included here. This is an awesome, well done lens! I never knew this was possible! Great lens! growing fruit trees indoors seems nice, thief is prevented. I had never heard of these trees before..what a great idea! A great lens! I used to have a lemon plant that I grew indoors. It was lovely and didn't really take up that much space at all! Very nice lens! I use to have an indoor lemon tree, but when we moved they made us leave it in California, because we did not have inspection papers. Your lens has been featured on our "The Green Thumb: A Place For Gardeners To Gather" Facebook page. I haven't, but I'm growing a Japanese Flaming Maple, and A Japanese blossoming Cherry for a water feature I recently constructed, and I love them. Thank you for the tips and an excellent lens. I learned a lot that will help me. This is quit an exhaustive lens...congratulations. Unfortunately, the link for indoor olive trees doesn't work. I fell in love with olive trees while in Italy last year and wanted so badly to bring one home (Can't! The Feds won't let you.) So I was very interested to see what you had to say about indoor olive trees. Maybe, I'll have to experiment a little on my own. Wow, I am really very impressed with this lens! So informative and with great photos. I actually never knew mini citrus trees existed, and now I'm sitting here thinking about getting one. Or two. Thank you for sharing! Wow what a wonderful lens. I have book marked it for later. I love the mini citrus fruits. So much information here. I have pinned you too. very informative! i want a kumquat tree now. Awesome lens! My parents have had a lot of success with citrus plants indoors, something I hope to replicate this year! Best information that I will act on. Lovely lens. I have grown orange and lemon plants from the seeds of a fruit (not a kit), and though they never bloomed, the leaves are fragrant and taste like citrus. Thank you, I have always been curious about keeping real, fruit producing trees indoors. Very informative lens! Thanks so much! Nice lens! I'd love an indoor lemon tree and also indoor strawberries. Just planning what to do - do we buy some citrus plants for indoor..great lens. This is great, I just wonder if is non GMO? Great Lens. Now I can continue with idea of having indoor Citrus Trees. These could make for a very interesting indoor space. This is a great lens with tons of helpful information! I've been wanting to put a small tree in my home for the benefits of it. I think a citrus tree will be perfect. I'll definitely be back for these great tips! I was wondering if I can grow a lemon tree(small ones) indoor...might tried one this year. Thanks for the info. Wow, so much amazing information and so many tips! I live in NYC and I miss my childhood in California where we had lemon, orange and avocado trees in the backyard. Maybe I can still try to grow fruit trees ... indoors! love this lens. very interesting. Thanks for sharing. What a fantastic idea. I'm going to check on this. We might be able to grow a tree or two inside. Thank you for publishing this lens. This is a very comprehensive list and I am going to try this out. Love plants and flowering ones that bear fruit are even better. Thanks, I like this lens. Love citrus trees! This lens is full of great information.. I love plants that flower in the home, but never thought of fruit trees. Gotta try it! Great lens. Great lens! I never thought of growing fruit indoors. Thanx! My dad grew an orange tree on our patio...then carried it to the basement in the wintertime. This was in northern Illinois. I'd like to try to grow one myself. Great information here.